serious question... It is even worth updating from the 0.9.7??? Apparently, the 0.9.9 is all about the PRO and very, very little about the N printers?!? I'm really thinking not to update to 0.9.9. especially because Vicky said that some features for N-series will be addressed later! And, yeah... a camera support... c'mon!!! Forgot! Not to mention that the features not related to a specific printer are rather confusing so they shouldn't be there in a first place! If Raise3D decided to go to another "product line" then there should be two forks of the firmware! Jetguy wrote: I know this would make Raise 3D unhappy, but I think here is a problem. Hey Jetguy... YOU ARE SPOT ON!!!! But, Raise3d showed time and time over, that the customer is not their priority. How strange does that sound...hmmm. If I would be thrilled to know what my customers want from me! I would literally pay them money (or discount or gift or...) for every good idea. What we as users do is to free test their garbage (well is not free for us as we usually have to pay for it, not as some "YouTube testers" that are supposed to give a good review) and improve it!!! I would at least hope that Raise3D would appreciate our effort and listen to us! I JUST wanted to update my printers with thermal protectors i received and update firmwares. Can you tell me what are the last firmware and touchscreen firmware that are "safe" for N2 and N2+ please ? i try to read everything but there are a lot of informations and it's not easy to know what is really important in these firmware updates. Sorry If I have contributed to that confusion. 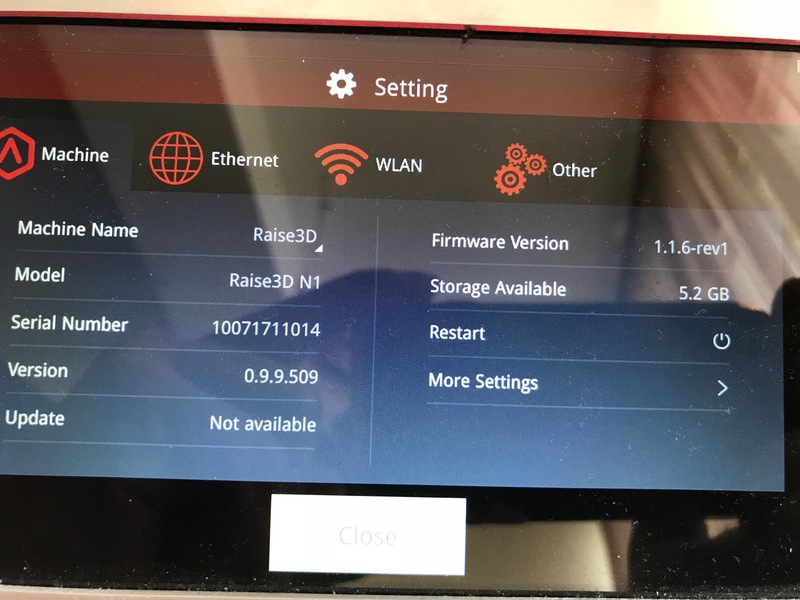 #1 I still believe that in most cases, we are at a point you should attempt to update to the latest version to get all the features and improvements with both firmware version (Raisetouch and Marlin). We are still in the bug fixing and new feature in nearly every update. #2 While some commented that a new feature is annoying to them in a personal way, I'm not aware of an issue in the latest Raise Touch update with moving the bed down when a print is cancelled as being a safety issue. the more annoying thing is it not being announced or discussed, not mentioned as a change in the release notes, not being a new feature you can disable. To be honest, most of the anger comes from them making changes like this that do affect users, and the documentation says not a word about it. #3 The one user having what I'm 99.99% sure is a hardware issues, may have invoked a hidden limitation or bug I kicked over in Marlin firmware 1.1.16 safety code. At the same time, the user had not yet installed the safety board so again, this mostly a hardware issue. Like I said in that topic, the reason the code I questioned has not really had answers, almost nobody, until that single person found the magic bullet to invoke the error on the heated bed safety portion of the code, and all it's doing it preventing them from using a certain preheat sequence. Again, its like a catch22, nobody until just then has reported a single instance of invoking the bug. I identified it and one other person in source code- when you edited the code for custom printer tuning. The flipside is, the other firmware you know has a bug and the only other official one is 1.1.1 and that will invoke the stepper timeout during a pause. I generally do not recommend anyone run that firmware with a known bug, this single circumstance where a user invoked a unique situation and needed to troubleshoot was the exception. Again, as noted, the latest Raisepack 0.9.9 does add even more features, some of them security related (invoking a password to connect over the network to the printer with Ideamaker) that are for all models of Raise 3D printers (Pro and non Pro). I personally run at a minimum, the previous 0.9.7 raisepack and again, nothing "wrong" IMO with the 0.9.9, the users are mostly upset about lack of a camera and change on distance moved when a print is cancelled. I personally do not see those as reasons not to update, but again, that's my personal usage scenario. My complaints were aimed at hopefully making the next update better, both for the next Raisepack after 0.9.9 and we need a new proper official Marlin higher than 1.1.16. #1 Add USB camera functionality now currently implemented on the Pro 2 and literally promised since the Kickstarter campaign or ALL models (basically, give it to us on the non Pro). I still think even when users get this, you will find that 3rd party solutions are more feature rich than the integrated Raise 3D camera function, but that's no reason not to have it. #2 Give users the option on any new feature added, especially changes in a script or function, that the user can enabled or disable and return to the old function. This recent change in cancel move distance, I cannot ever remember seeing a single discussion on it, and yet bam- just shows up completely out of the blue and undocumented, and key here, unable to disable. At the same time, on the Marlin firmware side, seriously, only 2 major versions 1.1.1 and 1.1.16 since the kickstarter!!! It's like pulling teeth to get major advances here and how long did users live with the pause bug until 1.1.16 finally was released? #2 Should include pressure advance as a STANDARD feature- it's 2018, lets get this much improved print quality feature. #3 Should enable EEPROM and apparently like the Pro2, include storing toolhead offsets at the printer, and invoke a major change to match the REST of the 3D printing industry at the slicer level to support this change. Again, this one is a big change, but apprarently already invoked on the Pro2 series, and absolutely no reason other than forcing a user to buy a whole new Pro2 to not invoke back on the non-pro series and come to parity with the rest of the 3D printing world. #4 FSR (Filament Runout Sensor) should be STANDARD regardless if you have the sensor or not. There is no reason this should have not been an incremental update to ALL users as a single unified update version. If you don't have the sensor it does not matter. Last, somewhat in contrary to the rule, recent update to ideamaker have made that application and update version more problematic than other other topic. Recent fan control changes are just really troubling in without any discussion or announcement. I'm on the fence on this one and maybe other users don't see it as much of an issue, but being dead honest, even I don't know the best version yet to run. I think 3 versions back was before I started getting crashes, the last update that fixed crashes invoked the fan control nonsense, so again, sorry, I didn't create this nightmare, I'm living it with you fellow users. Jetguy wrote: Last, somewhat in contrary to the rule, recent update to ideamaker have made that application and update version more problematic than other other topic. Recent fan control changes are just really troubling in without any discussion or announcement. I'm on the fence on this one and maybe other users don't see it as much of an issue, but being dead honest, even I don't know the best version yet to run. I think 3 versions back was before I started getting crashes, the last update that fixed crashes invoked the fan control nonsense, so again, sorry, I didn't create this nightmare, I'm living it with you fellow users. I just wanted to comment on the fan issue even though it is a bit off topic. I was able to stop the automatic fan adjustments by simply setting the "Minimum Layer Print Time" to 0.1 seconds. Have no idea if this will have another unintended effect but it does fans stop the unexpected fan changes. I mean the version number of the ideaMaker you are currently using. The Allow Remote Access without Password option is under More Settings -> Privacy and Security. We have debugged the issue. It will be fixed in the next version. In the current the Z drop after print complete is down to 100mm (if the final height is already over 100mm, the bed will stay at the final height), the previous version was 20mm. The increased height is for providing enough space to remove the model. We will open this option in future versions for customer to settings how much they want the bed to move in the end. Jetguy wrote: Sorry If I have contributed to that confusion. So actually, I am wrong and missed a pretty major issue when writing this. 0.9.9 Raisetouch does have a print resume failure as identified by others. 0.9.7 did not have this issue. So yes, sadly, stay at Raise Touch 0.9.7 until a newer version higher than 0.9.9 comes out. Raise 3D probably should pull the update and put 0.9.7 listed until the new fix comes out. Last edited by Jetguy on Mon May 21, 2018 1:09 pm, edited 1 time in total. Vicky@Raise3D wrote: I mean the version number of the ideaMaker you are currently using. This was a bad idea to not let people know you were making this change and not provide an option for it to stay at it's current bed height. It automatically shut off bed temp, and if printing at 110°C it takes a bunch of minutes to get back up to what temp was lost. Have you tried one more time with disable the option Allow Remote Access without Password under More Settings -> Privacy and Security? We have debugged the cooling down issue. Will update a new version very soon. Notes taken. We will try to bring the options you mentioned into reality in future versions. What worries us is whether 110C heat will be harmful or not during removing or clean the build surface after one print completes and before the next one starts. Vicky@Raise3D wrote: Have you tried one more time with disable the option Allow Remote Access without Password under More Settings -> Privacy and Security? What about the rollback version? The previous version doesn't include connection problem for your printer before. Can it work properly on your printer now? I installed the old version but no result could it be a hardware problem? I understand the concern for the 110°C being from one print to the next. The problem is high temp is required with ABS settings... And, many have had issues with ABS printing on the N series. I, on one material in particular have had issues with this new drop in the bed because I of material failure and the N2 overlapping of solid layers (not yet addressed by Raise3D in http://forum.raise3d.com/viewtopic.php?f=4&t=8431. Stopping and restarting may happen often to get the settings just right, including between materials. I would like it to not have to wait for the bed to finish dropping (if I stop the print) because I have to manually set the bed temp to 110°C (saving a long reheat time). It takes quite some time to get back to 110°C. By the time the material has failed or needs settings adjustments, I can have updated print settings so that I can remove the failed print and start with new settings quickly. This new bed adjustment setting adds minutes between prints. Unless a new setting to be added for the bed temp to not drop at the stop of a print, The bed adjustment to the middle just causes unnecessary time.